CACITA (Autonomous Center for the Intercultural Creation of Appropriate Technologies) and their bicimáquinas have become an inspiring example of individuals sharing alternative tools that support the creation of autonomous, resilient communities. Since CACITA started in 2004 they have visited almost every town and region in the south of Mexico involved in the ongoing struggle for autonomy. These communities are resisting dominant colonizing trends of “development” which destroy natural and social systems and attempt to seize land and knowledge from the people. What are you learning by bringing bicimáquinas to different contexts around the world? First of all, we are learning to build the technologies in better ways. We were already improving the bicimáquinas before, but the Ruta de Resistencia allowed us to do more of what we like to do: to be with communities. In particular, certain communities face very specific challenges like development mega-projects (i.e. mining and energy projects) imposed on them without any explanation as to why their resources must be transformed or extracted in service “development,” and without any communal benefit. We have learned a lot from their ways of resisting, their struggles, the ways they organize themselves. We realize that it is there, at the service of these people, where this appropriate technology should be. The bicimáquinas offer an alternative form of development, far from mainstream technological systems. How do you adapt the technology according to the real and current conditions in the place where you are working? It’s very simple, you just have to work with the people at the grassroots; from the very beginning asking what they want, what need can be served. It’s not about trying to implement things that they don’t really need, that are in fashion in our modern times. Paying attention to local patterns and remaining aware of the local culture is very important, especially in indigenous contexts. It is also important to say that we do not call our work “alternative,” we call it appropriate technology. It is essential to us that what we’re doing be appropriate for the context we’re working in. What is the purpose of the tour in Germany? Firstly, to understand who we are, who they are, and what we can share together. It’s important for us to see what can we learn and understand about life in other contexts, in another country, on another continent. There is a long story of solidarity, but we want to explore what else we can exchange, bring back, adapt and apply to our own realities. It’s about exchanging concrete knowledge, but fundamentally it’s a chance to practice sharing what we’re learning. We are also interested in raising awareness around the specific struggles in Oaxaca, to let them know about these development mega-projects that only serve the mainstream economy system, that are destroying social fabric, ancient tradition, cultural patterns and local economies. It is important that they know that the scale of the projects is also a problem. Some of them are even promoted as “environmentally friendly” alternative technologies. For instance, the windmill project in the Isthmus that produces electricity on a massive scale, but only to serve the industrial complex without any benefit to the local population. This project has even taken away their land and destroyed the agriculture economy in the villages where it has been implemented. 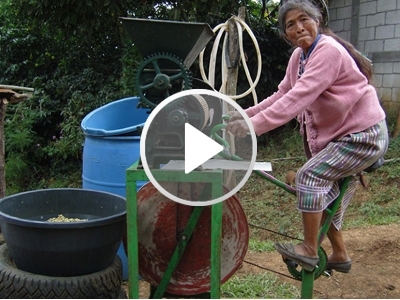 How are you applying what you’re learning in your travels to your work at CACITA? We are challenged to find new applications for our bicimáquinas, to be able to contribute to leaving behind what has been imposed on us in the field of technology. But we have also learned how people fight back and resist the imposition of alien models; how they build political alternatives; how they use the appropriate tools to defend themselves from the imposition of the systems of capitalism, neoliberalism, modernity, development. We have learned that we are who we are: human beings with our own roots and culture. And that this is much richer than what modern “knowledge” offers us. In our way of organizing we have learned to give more: more commitment, more strength, more everything. Our relationships with the communities demand creative engagement at the technical level, improved and diversified use of the tools. They require us to keep innovating and inventing new machines, with applications that we had never before imagined. But they also invite us to resist more, participate more, and engage as human beings, as individuals and as a collective. We are learning to be more responsible and conscious in our construction of the structures and kind of relations we want for the whole of humanity. Click here to see Margaret Wheatley’s calendar. Click here to see Deborah Frieze’s calendar.